Over the past year, I’ve written fewer posts than I did over the previous year. I certainly wasn’t cooking less. In fact, last year my weight crept up to a weight I haven’t weighed in about eight years. I’m unhappy about the weight gain, but for the first time in my life, I’m not allowing it to drag my spirits down. For one thing, I’m healthy. For another, I exercise. My portions do not quite push the limits of gluttony. I’m eating as much or as little as my naturally lithe friends who are also in their 50s. Yet there’s no denying that my hobby — cooking — has its consequences. According to recent studies, I should be eating less as I grow older, but I’m too interested in food to give up the pleasure of cooking for myself. It is inconceivable to me not to cook for myself because I live alone. Eating more green leaves and less meat constitute my primary methods of following the most current heath and diet advice. And I’m now growing as much of it as I can. 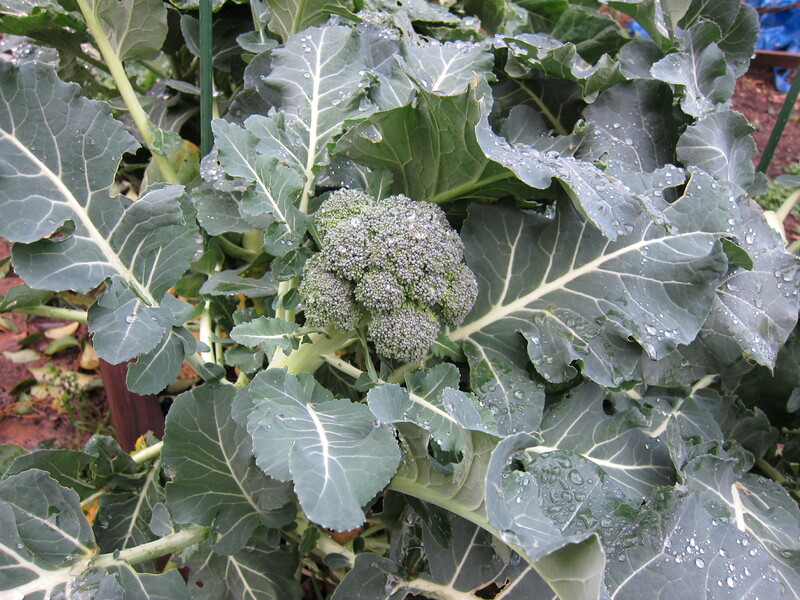 Last night, I cut off a few clusters of broccoli heads on the thick stalks that are now supine after the wind storm. I made Alice Waters’ Slow-Cooked Broccoli and eat it over pasta. It was more satisfying for having grown it than it was for the flavor, which, don’t get me wrong, was good. But the reason I haven’t been posting as often this past year has everything to do with fair use. I tend to use the same cookbooks over and over, the Gourmet Cookbook especially. There are only so many recipes I can post here without undermining my intention to persuade people to buy the books. I’m pleased that Shadowcook keeps drawing people who are looking online for solutions. The North Carolina Pulled Pork, the Memphis-style ribs, the Slow-Grilled Lamb Shoulder, Thomas Keller’s chicken broth, and the various pork belly recipes are the biggest draws. Few comments, which means people read and run. It means that my blog is achieving what I meant it to: I’m the one who tries it first and then reports on the traps, snares, and pitfalls. I’ve never made a claim that I was a great cook. I’m pretty good, but not outstanding. My greatest culinary virtues consist of the willingness to eat just about anything and the audacity to attempt making just about anything. In a week, I leave for a month in Paris. I’ll be renting an apartment in Montmartre, a part of the city I am a complete stranger to. While there, I’ll report on some restaurants and markets that I find. I’m going there with a couple of requests for obscure kitchen utensils so that means I’ll be visiting cookware stores.